Sorry I didn't post last week. I needed a short break. Oh come on! Don't hesitate now. Eloma, at least, has made up her mind to fight. And the other two are supposed to be part of the Earth Space Federation - Natty being a Weapons Systems Officer, at that. I think they're just getting started. I thought the effects used for the pot of boiling water are rather convincing. The steam is pretty good and the water splash, especially. And the spear the guard is wielding is rather nasty. The spear-point is so long that it's almost a sword on a pole, similar to a naginata. I bet that it's not only a very effective piercing weapon, but also good at slashing. So he could swing it around and cut two or three of them at once. I agree. A spear of moderate length with a nasty head would seem to be deadlier than a sword, but I think that if it becomes too long, like a lance or a halberd, it becomes slower and vulnerable to a faster enemy closing in with a shorter weapon. I think those long ones were usually used in groups to resist charges, but one like the one pictured here seems suitable for one to one combat. Of course, considering that 100% of my combat experience is limited to imaginary realms, My authority on the matter is questionable at best. That is the Mag Leung's standard issue small formation pole arm. The Leung prefer to fight in packs rather than alone so swords are less effective in tight formations. You can't swing a sword very well when you are elbow to elbow but you can thrust a spear forward. The blade is based on the Dalai's cavalry weapon known as the Naginata. The Dalai no longer have horses but the the Mag Mala still use the Naginata. 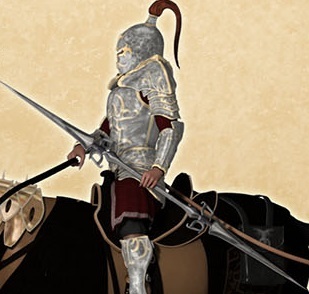 It's designed so that the cavalry soldier can easily fight on both sides of his horse. The Mag Leung's weapon in battle is the much longer (20') sarissa pike. They fight in formations similar to the Macedonian phalanx of 256 soldiers known as the syntagma. Despite cringing [I've had a chest, arm, and face scald burn before...and am currently treating a small one on my teenager's leg...ACK], I must say thats one of the best ways to take someone out of the fight in a hurry. My wife wants to know how you spike your hair like that!? Noemi really hates being on this planet because of the lack of hair products. it's as long as I still "breathE" not breath; and boy I am glad that they got rid of one of the guards, if not both. Gah! Thanks for catching that. I'll fix it when I get home later. No General Tso's chicken. You have to settle for the mind ripper ride instead. Tyranos' mind control coming soon!